We make Labels & Control Panel Labels on Poly carbonate Material in different colours with or without Logo. Pricing depends on Size, material thickness and no.of colours. We Manufacture Labels in Vinyl Stickers & Polycarbonate Material for Control Panels with or without Self adhesive Gummed sheet as per Customer's Requirements. 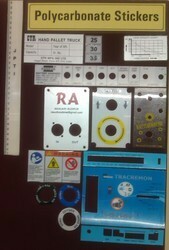 We make Labels for Lift Buttons in Polycarate in any colour as per customer's specifications.